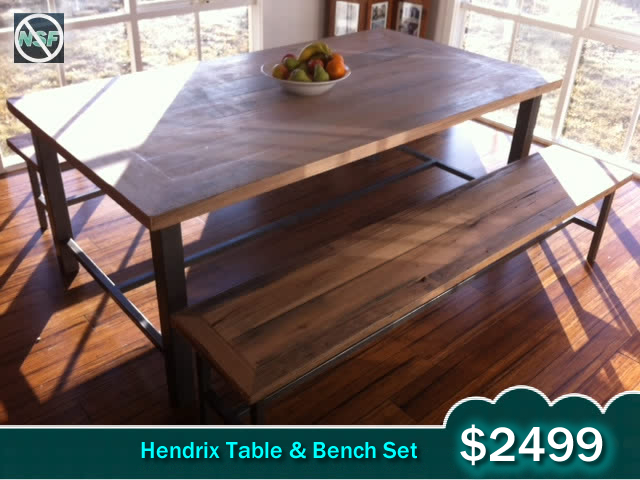 We build BRAND NEW CUSTOM HAND MADE table & bench sets. Don’t pay $4,000 or more for the same look that you can get for more then 1/2 the price. Why buy store bought factory furniture when you can get hand made for less? We use the best recycled & new timber, handcrafted with lots of love and pass the savings onto you! Get a quote now or place an order today! Bring home the old time Pine Lodge feel in our classic model. Pine slats compliment the natural look. Can be custom stained with the color of your choice. 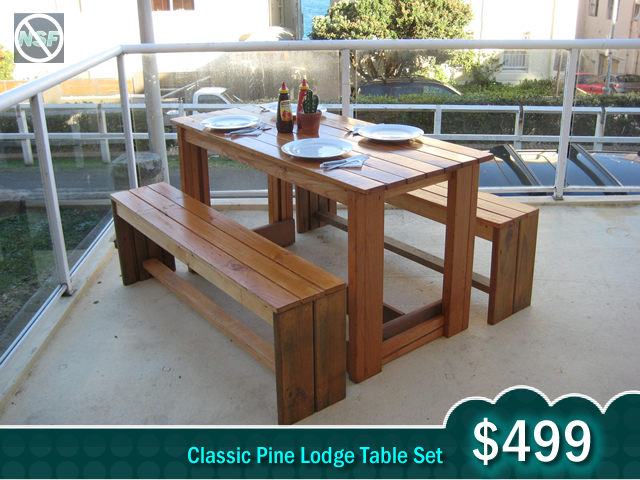 *Treated Pine or Australian Hardwoods for an additional Cost. 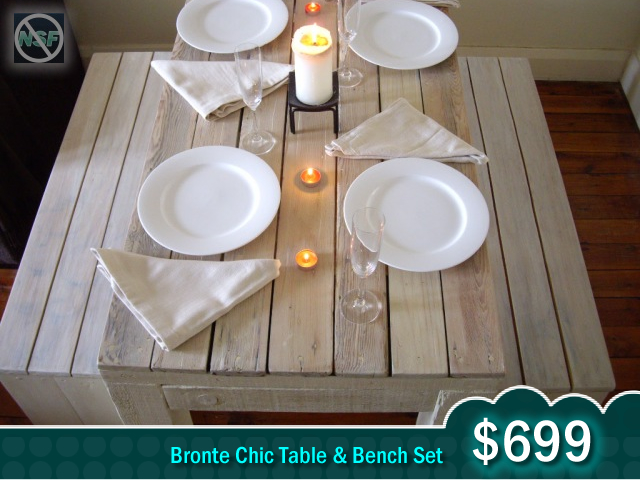 We know it’s supposed to be called “shabby chic” yeah right but Bronte chic sounds so much cooler. This beauty is made with a particular white wash distressed rustic look in mind. Think of the french country side and the beach coming together. Very nice, heavy and chunky table that can look great indoors our out. 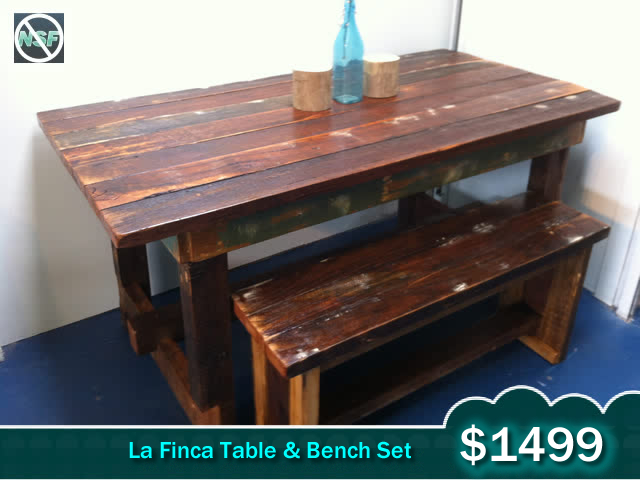 Great teak finish, beautiful centerpiece, heavy sturdy table with beautiful hardwood complimenting the sides. This is a very nice heavy table set. It will look great in any living room, dining room, kitchen area or backyard ares. Teak stain with clear satin poly finish. Very nice centerpiece has nice tones. Ready to bring the ALPS to your home? 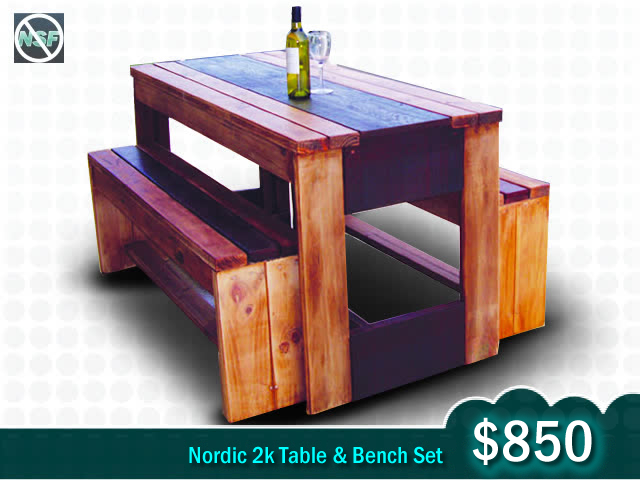 Then do it with the NORDIC 2k (1) Table and (2) Benches set. This heavy beautiful rustic piece will enhance any living room or kitchen area. Look around and expect to pay $1500 or more for this piece – and that’s just the table. Using a redwood stain for the center piece and complimented with teak stained this magnificent piece will last for years to come. Will also look great in your own personal beer garden. The benches are also designed to compliment the table with a strip of redwood stain. Very unique! Will seat 6-8 people comfortably. Would you like to be the king of the castle? The Queen of the Manor? Then the Chunky Checker is for you. This heavy chunky beautiful rustic piece is just what you asked for. Look around and expect to pay $2000 or more for this piece – and that’s just the table. Using three planks across the tops that measure ninety cm wide this baby feels big and chunky but still slim and refined enough for an elegant dinner party. The end legs are tapered on the edges and inset in for a refined kings look table. The benches are also designed to compliment the table with hardwood strips on the top an the ends are also inset and tapered. Choose your stain and be ready for the best table ever! Will seat 6-8 people. Larger sizes can also be ordered. Want to bring the country to your home? Then this is the set for you. 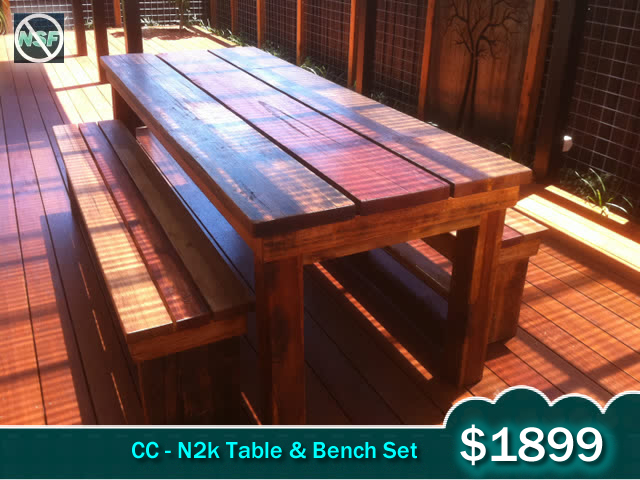 Combining recycled hardwood messmate with a teak wash stain you can get the cowboy look in your home or business. Using large planks across the tops that measure 80 cm wide this set feels rustic and large but can also tuck away into a corner when not in use. The end legs are inset on the edges and the large support beam across the middle finishes off the piece. The benches are also designed to compliment the table with planks on the top an the ends are also inset as well. Benches can be designed to slide underneath or be the length of the table. Choose your stain or go with the custom washed teak with weathered paint as show. Starts at 1.6 m long. Larger sizes can also be ordered. This new model designed per customer spec has been a crowd favourite over the last year. So we now we have brought it to the new model stage. The style combines a Chunky Checker design with a N2K (Nordic 2k) finish. The model starts at 1.8 m size table with 1.5 m benches. 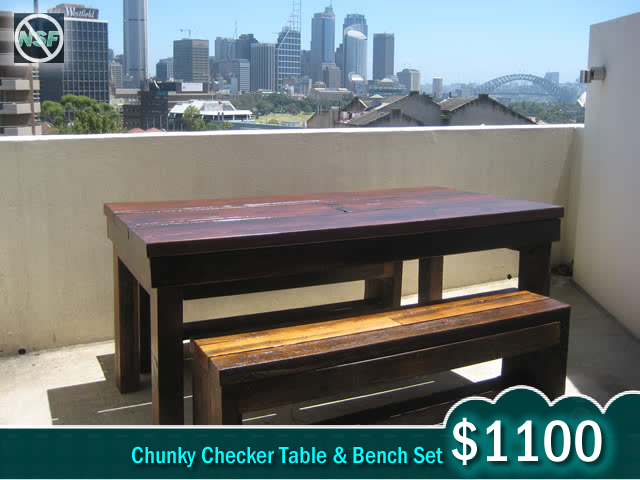 Weathered Australian Hardwood timber material along with a teak washed stain complete the look. 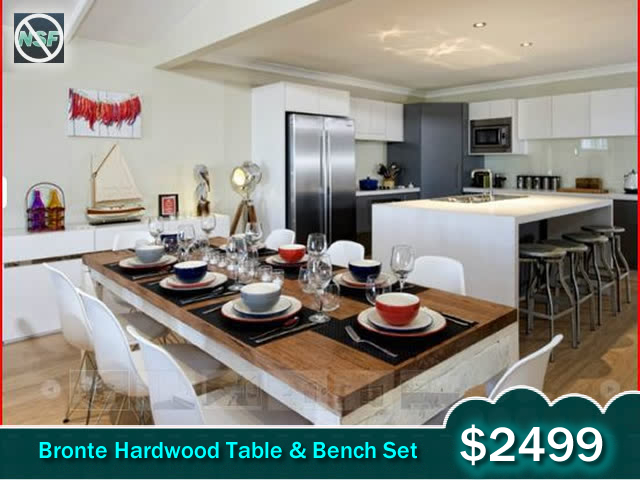 We also add a washed red gum stain down the middle section on the table tops and benches. As you can see the picture says it all. This table would be great indoor or out for your years to come. You can even change the stripe colour to compliment your area. This table set is large and in charge. It’s a modification of our very popular Bronte Chic with a big difference. The top is made from thick Australian Hardwood. It then has been stained with a chocolate brown wash stain and complimented with a few coats of satin polyurethane protection. You can choose your own custom stain and keep the base a solid off white or distress as per your taste. 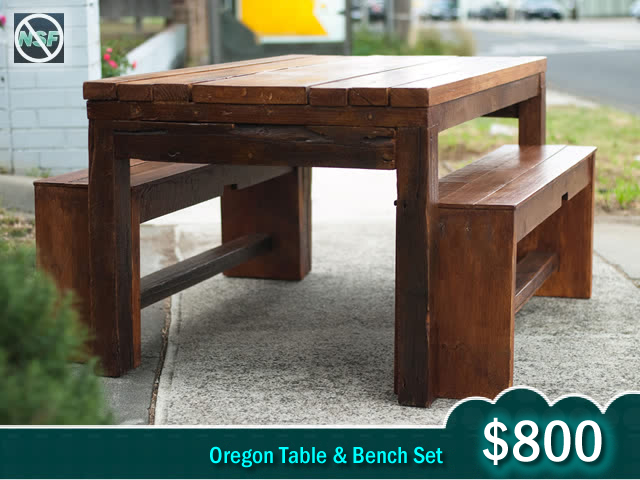 This table set is a fine combination of timber and steel. The base is constructed with 60mm galvanized steel with a custom charcoal hammered finish. The tops are constructed of recycled hardwood timber that has been joined in the unique and distinct pattern. The hardwood for the tops combined with the steel transformed this piece into a very unique industrial item that would look great in your home or business. You can also choose your own stain or base color. Since most of our items are custom this is no problem at all. Additional sizes can be made as per your request. Yes sure. You can come during the mornings during the week and on the weekends. You can contact Dean at 0405273411 to set up a time and for any questions that you may have. I was wondering if you ship to Adelaide? We are in the process of setting up a cafe and would love some of your bench and tables in our shop. Totally love your tables and bench seats. I’d love a quote on a 3.6m x 1.2 m table with bench seats that slide under the table in the Chunky checker for my farm house. This would be your biggest ever!!! We would love to help you out with this…this would be huge! I will send you a PM now to get the ball rolling.